I am a terrible fantasy fan. Why? Because I’ve never read a novel by Tamora Pierce. I am definitely going to have to correct that mistake by attempting to read her entire Tortall series, because, oh gosh, Tempests and Slaughter was magnificent. In Tempests and Slaughter, Pierce returns to the very early days of her Tortall series by focusing on the childhood, and eventual rise, of the powerful mage, Numair Salmalín, who is introduced in Wild Magic (Immortals, #1). Originally known as Arram Draper, the book relates his first few years at the University of Carthak in the School of Mages, and a majority of the book is undoubtedly setting up for the rest of the series. But it was still highly enjoyable. Tempests and Slaughter is the first pure fantasy novel I’ve read in a long time, and it’s such a welcoming feeling to return to a genre that you adore. While the characters tripped me up a little at the beginning of the book, Pierce’s clear writing – definitely something that is needed in fantasy – drew me into the story, and I was able to follow along perfectly for someone who is so completely new to the Tortall universe. A lot of the novel is focused on Arram’s magical education and the development of his friendships with a girl named Varice (who is his lover in another series) and Prince Ozorne, one of the seven heirs to the throne of Carthak … who later, in another series, becomes one of Numair’s most bitter enemies. While Tempests and Slaughter did an amazing job at highlighting the deep friendship between the two boys, it still set up little moments of disagreement between Arram and Ozorne, and I am highly excited to read about exactly how they become enemies in the next book, The Exile’s Gift. The novel progresses episodically, which means that there is no larger plot at hand: it’s basically Arram through his years at the university as he studies different forms of magic, meets a few gods, understand that slavery is abhorrent, and learns to utilise his healing Gift. However, there is still little snippets of a larger storyline, which I believe will properly come to light in the next book. In the meantime, I had a fun time piecing together the clues and having wild guesses. It was definitely an experience to come at this book with no knowledge whatsoever from the previous books in Pierce’s series’. The history and culture in the books was so fascinating. Carthak is a powerful country that conquers at whim, practices slavery, and has very intriguing political issues. At the beginning of the novel, there is a large number of heirs to the throne – perhaps around four or five left – but by the end, there’s only Ozorne and an older cousin remaining. I have my theories, but I won’t share them in case they’re considered spoilers. Undoubtedly, my favourite character was Arram. He has a very strong moral compass, and always tries to do the right thing. He’s shy, cautious, enthusiastic about studying, and fiercely loyal. He’s such a great protagonist and I loved reading from his perspective. Despite the fact that Arram could be a little obtuse at times, the reader has no issue reading between the lines that Arram cannot see and uncovering the secrets in the plot for themselves. 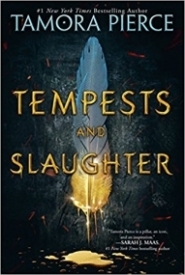 Tempests and Slaughter is a throughly enjoyable high fantasy novel that I recommend to Tamora Pierce fans and newbies, like myself. Although I was a little worried that I wouldn’t be able to follow along clearly – with my lack of knowledge – there was no cause for concern. The novel is readable, concise, and highly entertaining. I am so very excited to continue the series, now that everything has been set up in the first novel. In the mean time, I’m going to get my hands on a copy of the first Immortals book.